Grooming Standards - Soldiers may have a mustache, sideburns, or a neat beard for the Anglo-Egyptian War. In the 2nd Boer War, a mustache or no facial hair at all is most appropriate. Soldiers may not have a "soul patch" or "neck beard" or other unorthodox shaving pattern. Men's hair must be short on the sides and back, keeping well clear of the ears and collar. No obviously modern hairstyles are acceptable and any piercings must be removed. Aside from a wedding band, no jewelry or wrist-watches may be worn. 1881 Foreign Service Frock - The most iconic image of the British soldier, his red coat. The frock is an unlined, red serge jacket, single breasted, closed by 5 large Queen Victoria Crown General Service buttons﻿﻿. It is a looser fitting garment and has two plain red shoulder straps with small General Service buttons. The short standing collar is dark blue for the royal regiments. This frock is a working uniform and, unlike the Home Service Tunic, has no piping. The sleeves are plain red. The frock may bear appropriate Society-awarded ribbons. Foreign Service Helmet - Normally white, the pith helmet on campaign was stained khaki with coffee or tea. It is wrapped around with a gauze puggaree and often paired with sand goggles to protect the eyes. Glengarry - Standard black or navy blue with red tourie (pom pom), no dicing, worn with a brass Royal Sussex glengarry badge. 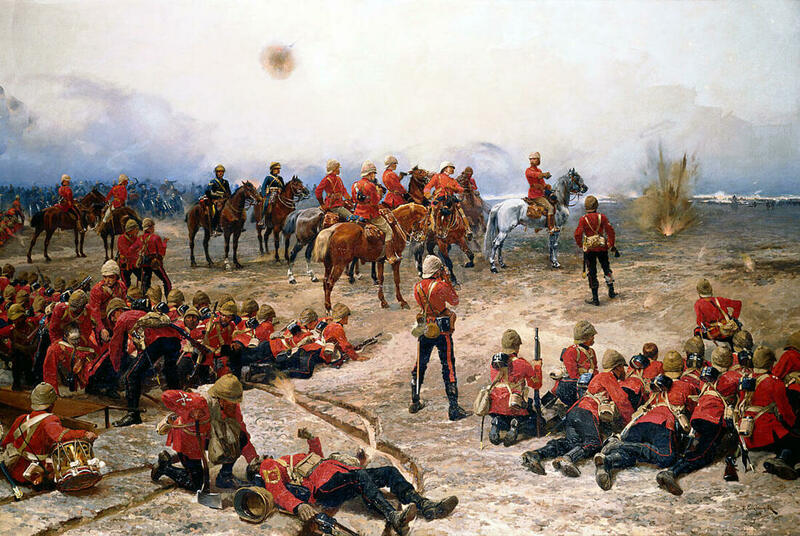 In 1882, the numbered regiments were abandoned, but it took some time before all numbered articles were phased out. Therefore, numbered or new regimental glengarry badges are acceptable. Greyback Shirt - A light grey flannel shirt with a band collar of white or blue and white ticking. The shirt has a bib front and is closed by tin buttons. Home Service Trousers - Navy blue high-waisted Victorian cut trousers with a 1/4" red welt down the outside seam. The trousers are kept up with braces (suspenders). Socks - Plain off-white or grey wool. Boots - Black "ammo" boots without toe caps. Valise Equipment, P1871 - Crudely known by some as the "Zulu War" equipment. A buff leather equipment suspension system which replaced the old shoulder belts. The P71 had a waistbelt closed with a General Service Buckle (formerly regimentally numbered buckles), two ammunition pouches, a black expense pouch, two braces, a bayonet frog, and it could carry the valise or knapsack, or the folded greatcoat, although these were almost always carried in baggage. The mess tin might also be transported on the Valise Equipment. Haversack, Mk. I, P1878 - white cotton canvas haversack with slider buckle on adjustable strap. The haversack was to keep rations and small items in. Wash Roll - Cotton roll to keep items such as fork, spoon, knife, toothbrush, razor, comb, brush, etc. Water Bottle Cradle, Mk. I, P1876 - Leather shoulder strap and carriage for the Oliver or Italian style wooden water bottle suspended in a buff leather shoulder carriage. Mess Tin & Cover - D-style mess tin often with internal tray and carrying handle. Cover is black cotton canvas. Blanket - Grey woolen army blanket could be carried on the Valise Equipment. Martini-Henry Rifle - Ideally a short-lever Martini-Henry Rifle in safe, operational condition with bayonet. Greatcoat - These are "defarbed" surplus Guards greatcoats. Long, dark grey wool, closed with five large Queen Victoria General Service buttons, they have the rifle patches, cuffs, shoulder straps, and rear belts removed. The collar is closed with a hook and eye. No decorations are to be worn on the greatcoat. Valise, P1875 - Knapsack for P1871 Valise Equipment rig. Gaiters - These were black leather with a combination closure of a buckle and lacings. Home Service Tunic - The tunic was worn at home in the UK. Scarlet wool, single breasted tunic closed by 7 large ﻿﻿Queen Victoria Crown General Service buttons﻿﻿ with two buttons to the rear. A small QVC GS button is on each of the shoulder straps which are red wool with ROYAL SUSSEX embroidered in white thread. The tunic is partially lined inside with white quilted cotton. The jampot cuffs and standing collar are navy blue. Two brass collar badges are worn approximately in line with the jugulars on the collar. A line of white piping goes along the front of the tunic and around the collar. Two lines of piping also delineate the rear skirts of the tunic. The tunic is form-fitting. The tunic may bear appropriate Society-awarded ribbons. Home Service Helmet - The blue cloth helmet was worn at home in the UK with brass chin-chain, rosettes, spike, and Victorian helmet plate with regimental center. Walking Out Belt - A P71 buff leather belt whitened, worn when not on duty. P1894 Foreign Service Frock - A khaki cotton drill single breasted frock closed by five small QVC GS buttons with a small standing collar. Shoulder straps and scallop-flap chest pockets are closed with small QVC GS buttons. Shoulder straps could have brass shoulder titles or be plain. Frock may bear appropriate Society-awarded ribbons. Foreign Service Helmet - As above. Helmet Cover - Khaki cotton drill cover of four or six-panel construction. Cover would either be plain or may have a small red wool "flash" on the left side with SUSSEX in white thread embroidered. The lack of the word "Royal" was unpopular with the men of the regiment who were proud of their status. Field Service Cap - Introduced in the mid 1890s to replace the glengarry, a blue "envelope" style cap with two small QVC GS buttons closing the crown band strap. Greyback Shirt - As above. Foreign Service Trousers - Khaki cotton drill high-waisted Victorian cut trousers, worn with braces (suspenders). Puttees - These were strips of light khaki or sand-colored wool (What Price Glory's "UK Fox Style Officer Puttees" 112 inches long), wound around the legs covering the top of the boot to just below the knee. P1888 Slade-Wallace Equipment - The third incarnation of the buff leather valise system, the P88 consisted of a newly designed waistbelt with GS buckle, braces, two ammunition pouches (often P1894 pouches by the Boer War), bayonet belt, and could carry a valise, rolled up greatcoat, and mess tin. The P1888 (and the P1882 which it succeeded) no longer had an expense pouch. Wash Roll - As above. Water Bottle - Round style metal water bottle with khaki, tan, or brown cover, suspended on a white leather strap. Mk.I Magazine Lee-Enfield Rifle - An 1888 bolt action rifle with a 10 round magazine with corresponding bayonet. 303 Ammunition Bandolier - A tan leather bandolier with loops to carry additional ammunition. Mess Tin & Cover - As above. P88 Valise - For P1888 Slade-Wallace Equipment rig. The P71 Valise will not work with the P88 Slade-Wallace design.